The brand's trusty lip balm family gets a couple of juiced up additions... and they're weird. 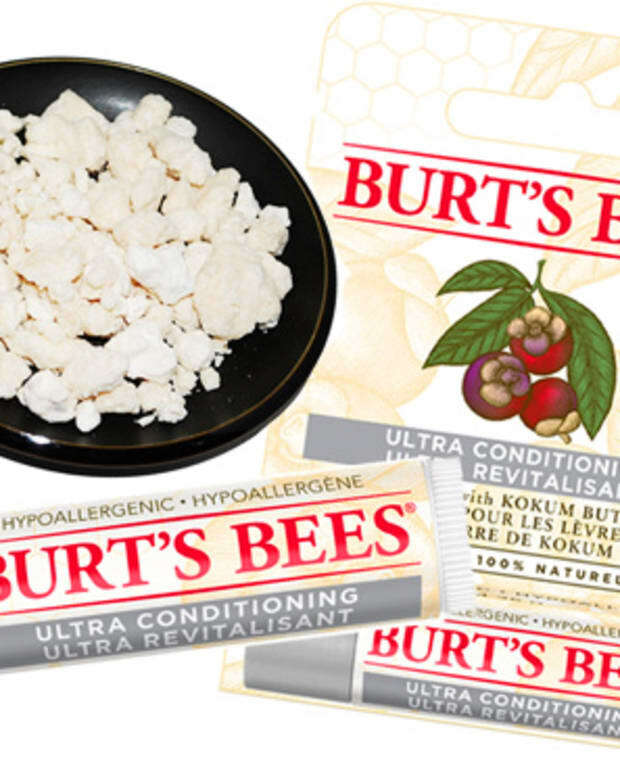 I&apos;m a little puzzled by the new Burt&apos;s Bees Flavour Crystals Lip Balms that launched earlier this year. Two flavours, Red Raspberry and Sweet Orange, are available in Canada. The US market also has a Tropical Pineapple. 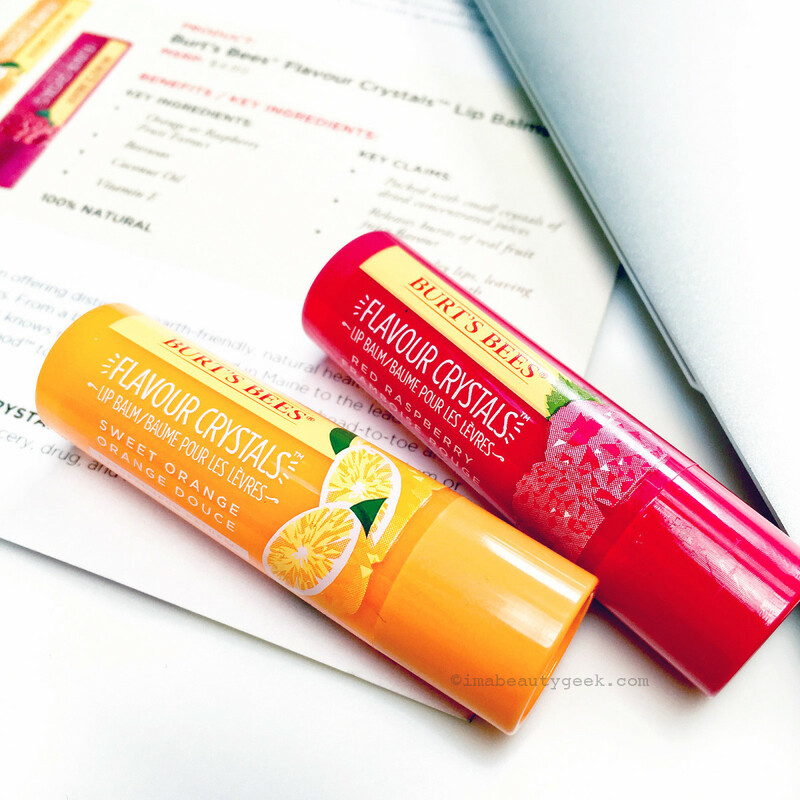 A new formula for the brand, each Burt&apos;s Bees Flavour Crystals balm has been dosed with "small crystals of dried, concentrated juice" to deliver a "burst of flavour" upon application. Sounds rather appealing, especially if you like fruit juice, but in terms of what lip balm is supposed to do, it also seems ill advised. Lip balm should stay put on lips to condition and protect – eating it off because it tastes good is a waste of product and probably worse for lips in the long run. What were you thinking, Burt&apos;s Bees? 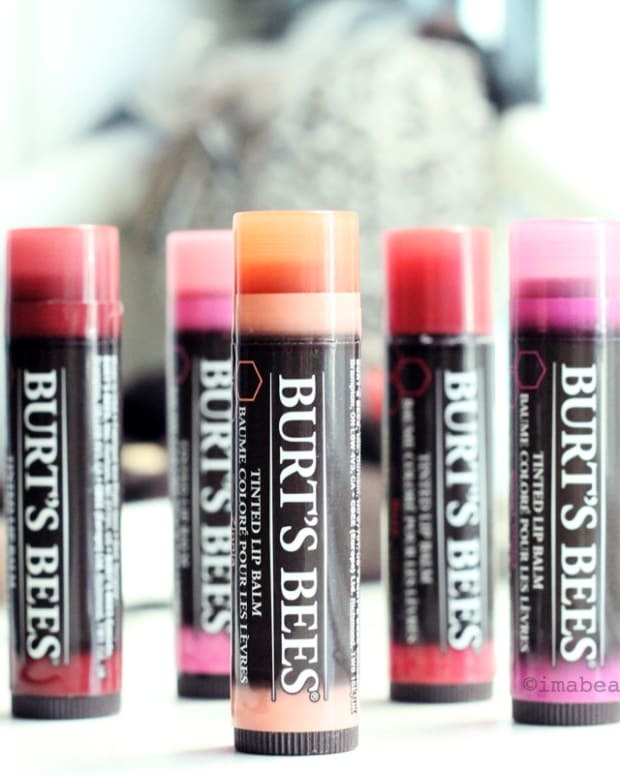 Burt&apos;s Bees Flavour Crystals Lip Balm in Red Raspberry and Sweet Orange: they&apos;re untinted. a) Okay, no problem with the natural recipe of beeswax, sunflower seed, coconut and castor seed oils, shea butter and vitamin E. That&apos;s a solid, reliable formula for a lip conditioner and protectant. c) And the crystallized fruit juice... yeah, it&apos;s a little odd, Burt&apos;s Bees. Makes the waxy stick feel more like a serious exfoliant – it&apos;s a shock when you expect a comforting salve, and sensitive lips may find it actually ouch-y. d) But wait: Interestingly, the thick waxy, scratchy balm quickly settles down over the lips and feels... totally fine. Despite the distinct exfoliating feel during application, the balm leaves no bits of buffed-off residue at all – the crystallized juice seem to dissolve into the wax over the warmth of the lips and becomes a smooth, protective barrier that stays put rather well. e) As for the "flavour," it&apos;s almost non-existent, more about a juicy scent than a taste you&apos;re compelled to lick off. And although the balm appears tinted, it leaves no colour on the lips. 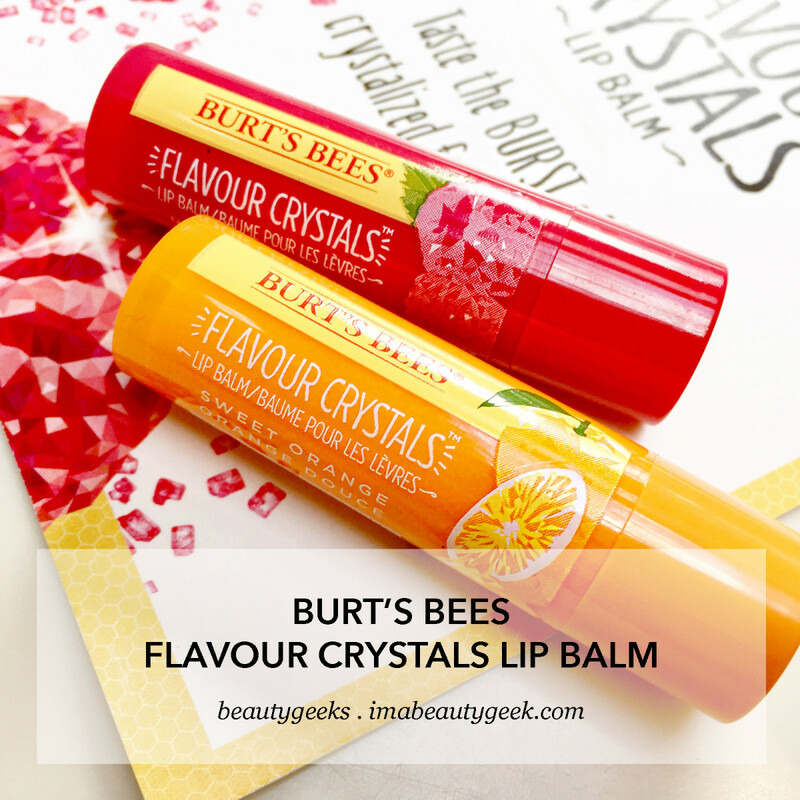 Burt&apos;s Bees Flavour Crystals Lip Balm in Sweet Orange and Red Raspberry: give them a chance. 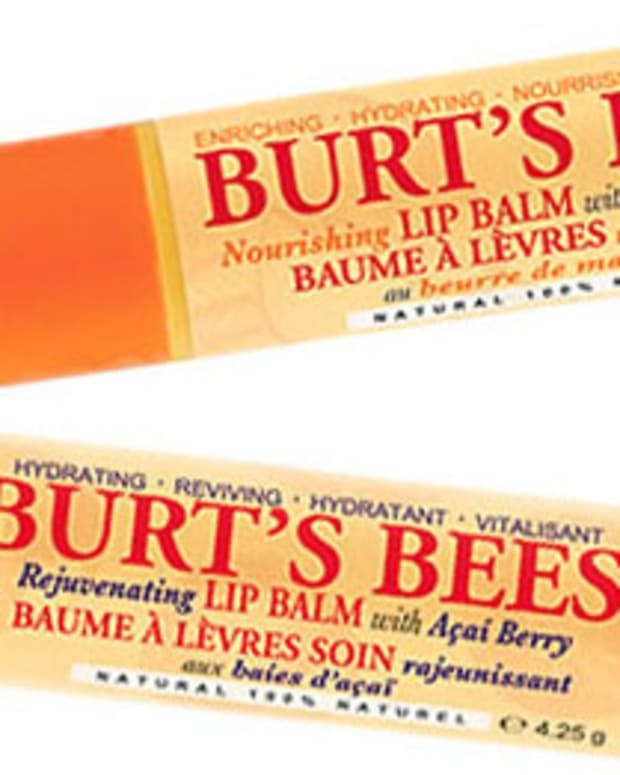 I&apos;m still a little puzzled by the Burt&apos;s Bees Flavour Crystals Lip Balm ($4.89 CAD at drugstores and $3.99 USD at ulta.com). It&apos;s truly weird with its initial scrubby waxy hardness. But after a few tries, I kind of like it – and I&apos;m generally not a fan of waxy balm. These actually make my lips feel smoother, and after a minute or two, the balm formula feels comfortable, despite a lingering bit of surface waxiness. I also like the fresh, real juicy scents, and really like that the flavour is so barely there. Verdict: Burt&apos;s Bees Flavour Crystals Lip Balm takes a little getting used to. 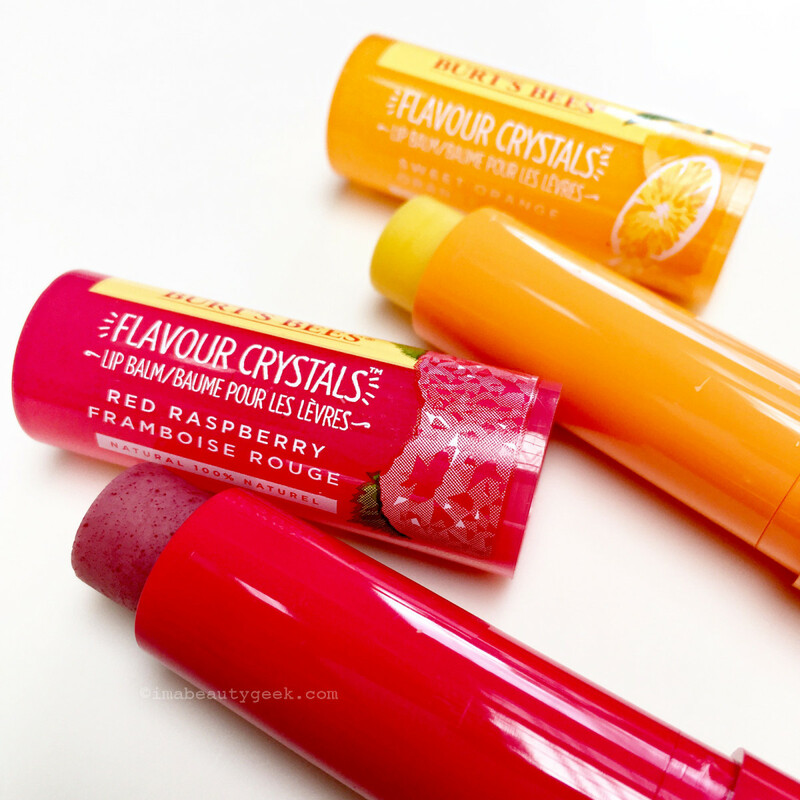 They probably should have been called "Flavour Crystals Exfoliating Lip Balm." The formula is more about scent than actual flavour (that&apos;s good), and if you can get past the initial, potentially off-putting waxy, scratchy texture, you&apos;ll be fine with the lip balm result that follows. Give &apos;em a chance, I say. Has anyone else tried these balms? What did you think? Burt&apos;s Bees Flavour Crystals Lip Balm in Red Rasberry ingredients: beeswax, helianthus annuus (sunflower) seed oil, cocos nucifera (coconut) oil, fragrance, maltodextrin, rubus idaeus (raspberry) fruit extract, behenyl olivate, butyrospermum parkii (shea) butter, helianthus annuus (sunflower) seed wax, ricinus communis (castor) seed oil, euphorbia cerifera (candelila) wax, olea europaea (olive) oil unsaponifiables, rosmarinus officinalis (rosemary) leaf extract, glycine soja (soybean) oil, glyceryl rosinate, hydrated silica, tocopherol, rebaudioside A, benzyl benzoate, benzyl cinnamate, citral, limonene, linalool. Burt&apos;s Bees Flavour Crystals Lip Balm in Sweet Orange ingredients: beeswax, helianthus annuus (sunflower) seed oil, cocos nucifera (coconut) oil, fragrance, citrus sinensis (orange) fruit extract, maltodextrin, behenyl olivate, butyrospermum parkii (shea) butter, helianthus annuus (sunflower) seed wax, ricinus communis (castor) seed oil, euphorbia cerifera (candelila) wax, olea europaea (olive) oil unsaponifiables, rosmarinus officinalis (rosemary) leaf extract, glycine soja (soybean) oil, vegetable oil, glyceryl rosinate, hydrated silica, tocopherol, rebaudioside A, CI 40800 (beta carotene), limonene, linalool, citral. Burt&apos;s Bees Flavour Crystals Lip Balm in Tropical Pineapple ingredients: beeswax, helianthus annuus (sunflower) seed oil, cocos nucifera (coconut) oil, fragrance, ananas sativus (pineapple) fruit extract, maltodextrin, behenyl olivate, butyrospermum parkii (shea) butter, helianthus annuus (sunflower) seed wax, ricinus communis (castor) seed oil, euphorbia cerifera (candelila) wax, olea europaea (olive) oil unsaponifiables, rosmarinus officinalis (rosemary) leaf extract, glycine soja (soybean) oil, glyceryl rosinate, hydrated silica, tocopherol, rebaudioside A, citral, limonene, linalool.